Need help programming your Norstar Modular ICS system? 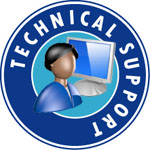 Our expert technical support staff has over 20 years of experience and can help solve your problem today. After your purchase, please contact us at 800-929-8061 with your order number, and you will be connected with a technical support specialist.